I have had a fascination with this for a while now. It was several years ago that I began to notice that most people, including people who have read Whitley Strieber's Communion, many of them more than once, seem to think the alien or being on the cover is grey in color. Well, it isn't. I began to point this out to people, some would not believe me until they got out the book and looked for themselves. Does the popularly known alien race known as "The Greys," have different skin tones other than the color, grey? Really answer 1 and 2 are the same answer, so that means 58% think all beings that physically look like the Greys are grey. Now it has been a long time since I read Communion, but I don't remember "the visitors" being described as grey. In fact, I am sure I have heard Whitley say in recent times that the alien on the cover looks exactly like he remembers it. None of the Greys in the movie are grey in color either, they all look like the one on the book. Although that wasn't the best movie, it is still likely that they created the aliens using the description in the book. I like to call the Communion color aliens the honky aliens. Back before the term "Greys" to describe the little big eyed visitors came into being, there seems to be a lot more reports of the honky aliens. Witnesses that allege to have seen the Roswell aliens describe those as being a tan color rather than grey. Although, my internet search did not yield any results for specific cases of tan colored Greys, they were mentioned on several websites along with white and even pinkish colored Greys. 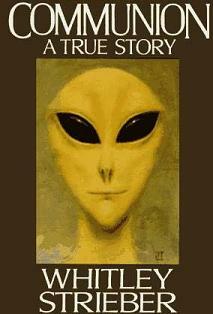 I am sure that over the years, aside from Communion, I have read many accounts of Grey aliens that were not grey. Most of the above is beside the point though. The thing that fascinates me about "The Greys" and especially the cover of Communion is that people seem to be almost programmed to believe Greys are grey. How many people have seen that book cover and didn't even click that the alien wasn't grey? I will guess that at least half of them didn't realize that, given the results of that poll. That poll was from Paranormal Meet, a place that you would think that the members would know more about aliens than the people at a regular news website or some site like that. Is there an organized conspiracy to get everyone to believe that aliens are only grey? Is the more tan colored skin tone too close to our own and maybe doesn't seem as fearful? They actually seem equally as fearful to me. Does some "them" out there not want us to remember tan colored Greys, only grey Greys? Even stranger than that, in the accounts I have read (the ones I remember anyhow) the Honky Greys are not ever with the Grey Greys. Is there segregation in the alien realm, or are these two completely different beings, from different worlds that just happen to look exactly alike except for skin tone? Maybe the honky Greys are hybrids, but you would think there would be more differences from a typical Grey than just the skin tone. Most hybrids I have heard described look a lot more like humans, it isn't just a skin tone difference. Maybe people just assume all Greys are grey because we call them Greys. I wonder who came up with that term for them? OK, you may have guessed that I don't really know what I am trying to say with this and have no real point, other than pointing out there is not a grey colored alien on the cover of Communion even though most people seem to think there is. I just find that astounding since Communion is probably the best selling and most known alien book ever. Many people who bought Communion were not at all interested in aliens until they were somehow drawn to the cover of that book, to the tan colored alien with the huge eyes and yet many of them don't even realize the alien wasn't grey.